The other day, I soaked and cooked a bunch of dried bamboo shoot (mang kho) and squirreled them away for Tet so that I could simmer some with pork hocks. But the chilly winter weather got to me today and I defrosted a batch of the prepped bamboo shoots to make bun mang noodle soup, a Vietnamese favorite; bun refers to round rice noodles (think bun rice noodle salad bowls!) and mang refers to bamboo shoot. 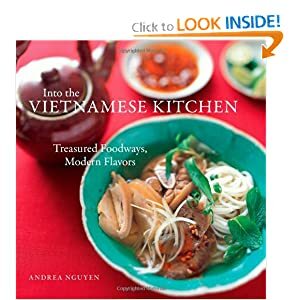 I looked in my cookbook library and found Vietnamese recipes that paired bamboo shoot with chicken, duck and pork hocks (called bun mang ga, bun mang vit, bun mang gio heo, respectively). Chicken is the fastest and easiest to make as it is readily available at any supermarket. It’s also less expensive than duck and lighter than pork. Vietnamese food is often quite simple yet seemingly complex. That's the beauty of this preparation -- just a few average ingredients coming together for spectacular results. People have asked me what makes bun mang taste good. 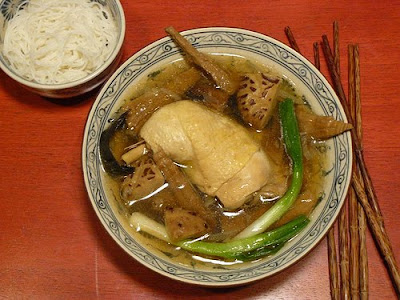 The answer has less to do with the protein than the quality of the bamboo shoot; for tips on buying and preparing this standard Asian ingredient, read “How to Cook Dried Bamboo Shoot.” The dried bamboo shoot lends its golden hue and naturally sweet-savory flavor to the broth for bun mang. Normally, wood ear mushroom is added for contrasting color and crunch but I love to drop in some reconstituted shiitake mushrooms so that the soup is super laden with umami goodness. Long-cooked dishes like bun mang are traditionally prepared in advance and offered to the onslaught of guests during special events such as Tet, weddings, and funerals. I couldn’t wait for a celebratory occasion to make this dish so I cooked it for our dinner last night. It’s satisfying winter and spring fare that benefits from the richness of the chicken and the soft-chewy meatiness of the dried bamboo shoots. Viet cooks also prepare bun mang with fresh bamboo shoots, boiling them separately to remove their bitterness and then adding them to the pot midway through the simmering. The fresh bamboo shoot makes for a tasty bun mang noodle soup but dried bamboo shoot is superior. Before embarking on this recipe, make sure you have the golden rock sugar (duong phen) as it pulls all the elements together. Golden rock sugar is one of the stealth ingredients for good Vietnamese pho broth! Get it at a Chinese or Vietnamese market. See the "Note" in the Chicken pho recipe for a photo of the rock sugar. 1. Cut the bamboo and or hand shred it long narrow pieces, about the size of a skinny index finger. Set aside. 2. Trim off excess fat and skin from the chicken. 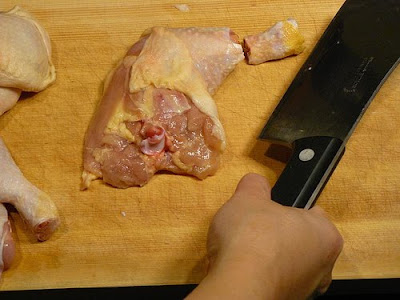 If you want a nice presentation in which the skin doesn’t pull away in an awful manner from the end of the drumstick, use a cleaver to whack off the chicken knees. The flesh and skin will pull up beautifully during cooking. Toss the knees in the simmering broth. 3. Sprinkle the salt all over the chicken and set aside. Heat the oil in a 6-quart pot over medium-high heat. Add the shallot and cook, stirring frequently, for about 4 minutes, until soft, translucent and sweetly fragrant; as needed, lower the heat slightly to prevent browning. 4. Bank the shallot, increase the heat to high and add the chicken, skin side down. Lightly sear the chicken on both sides for 1 to 2 minutes, turning midway. You don’t have to brown it; just get the skin and flesh to contract and no longer look totally raw. Add the fish sauce and continue cooking, stirring for about 1 minute, until a slight syrupy liquid forms at the bottom of the pot. Pour in the water. 5. Bring to a boil, skim and discard the scum, and then add the rock sugar and bamboo shoot. Adjust the heat to simmer. 6. Cook, uncovered, for about 1 hour, until the chicken is tender but still slightly chewy. Stick a bamboo chopstick in to test. Regardless of the bamboo shoot used, it should be soft enough to eat and not tough; a little crunch is okay. Keep cooking, partially covering the pot, if necessary. During the last 10 minutes, add the shiitake and wood ear mushrooms. 7. Skim off excess fat, if you like. Taste the broth and it should be slightly sweet and rich tasting. Continue cooking if it isn’t. If you worry about overcooking the chicken, remove it from the pot during this additional brewing time and return it to the pot when you are satisfied. Cool and refrigerate if not serving right away. 8. Arrange the noodles on 2 plates in 3-inch mounds for serving. Return the broth to a boil, taste and if necessary, add extra fish sauce for savory depth. Add the scallion and cook for about 30 seconds to just soften but retain its bright color. Transfer to a tureen or large bowl and serve with the noodles. If you like, serve the chicken on a separate plate to make it easier for guests to get at it. Invite guests to put a small portion of noodles in their rice bowls, then add some chicken, mushroom, scallion, and broth. For some kick, add a slice or two of the chile to the bowl. Have you had bun mang noodle soup? Where and what was it like? Any suggestions for tweaking this recipe?